Discussion in 'Pin Comparison' started by Geoff, Dec 19, 2010. Now available for download!!! Great for taking to any park when you are trading, and good for sending out in shipments too. Meant to be non-offensive and objective. I left the entire original post and everything I added up so that you may see how it grew and progressed; this started out as the work of one and ended up the work of many as you can see. Input and ideas are still welcome, just add a comment if you have questions or comments. The most updated version can be found on page 2. With that said, enjoy!!! I finally got sick enough of counterfeits and scrappers to do something about it! In my last post, I joked about making a pamphlet about it; well, its not a joke anymore. Take a look and let me know if I should make any changes. I would hand these out at DLR Anaheim and only to people genuinely concerned about fakes, or saddened when they learn they have a bag full of them. Oh yeah, and you see someone handing these out someday, its me or my wife Jessica. Good way to find us in the future. It's really disappointing that Disney hasn't taken an initiative like this and made flyers available at all locations where they sell their pins. Or, at least I've never seen anything like this. Has anyone else seen anthing from Disney? I'm glad there are fans like the ones on this forum taking the charge at least. Geoff, you should make this available as a PDF file somewhere so we can all print them out and help spread the word! In the "One Way to Tell" and "How to Tell" columns, it was not immediately clear whether you were describing good pins or bad pins. I had to read about halfway down in each column to see which you were talking about. Just food for thought. These would be good to mail out when you're doing a trade. Great idea! The only thing that would give me pause, is the prominent placement of #2, and the mention of paint dips. I just posted a comparison about a pin released in 2000 that had a significant paint dip and a color. 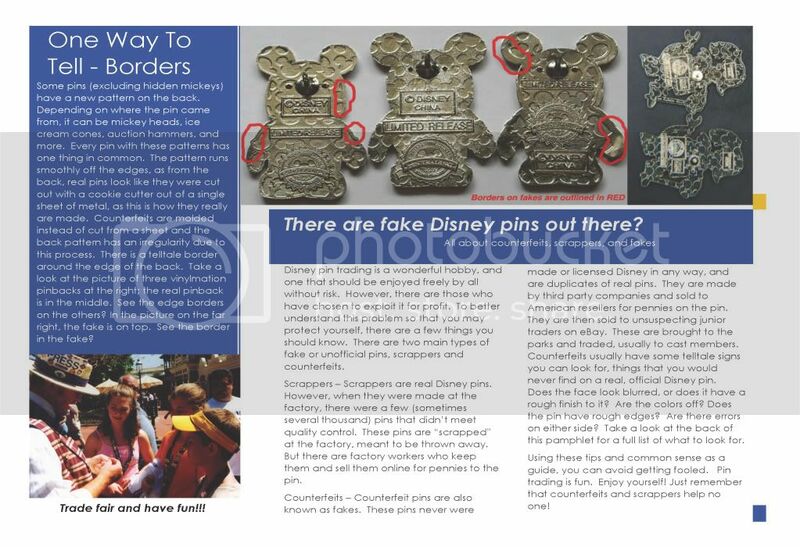 While, I agree that many of the scrappers and counterfeits have dips, if that is the only issue with a pin, it is more likely an actual Disney quality control issue (they do exist). I have been working on framing my pins, and examining a lot of my pins, and even in pins I purchased from Disney, there can be issues. I only mention this, because of the panic that some people get into when they see a paint dip. Dip + other issues = worry, Dip only = bad Disney. I also would wonder how people would react. While some people are appreciative of knowing the difference, there is a lot of defensiveness that can come out. So if you do distribute, just be prepared for some backlash. Also, if you are distributing them at the park, someone might confuse them with an actual Disney pamphlet, which could get you into a little trouble (asked to stop distributing them). Especially, with the PTU images. I know why you used them, it's pin knowledge and it's cute, but it's using Disney's images which gives it the appearance that it came from Disney. I don't mean to be a downer, but I have seen managers approach people in the park and ask them to stop doing things because they could be confused with actual Disney CMs/official Disney information and I wouldn't want you to get in trouble for doing something, even though it comes from the right place. I commend you for taking the time to do this. As Flaneur stated, maybe make that small change / addition to the information and you got it. I think it is a great movement in the right direction and awareness is a very important part in helping control this problem. maybe on the checklist you could put the word potential scraper of counterfeiet in there just to cover it lol cos there have been alot of talk about colour and dips etc sorry for my spelling he he just a sugestion apart from that its good and informative especially for newbies like me!!! them pics really helped me!! Thanks all!!! I will make some changes, as suggested. I made it around 4-5 AM and I knew I would miss some things. I'll add that the list is describing problems with counterfeits/scrappers flaneur, and I will make a note about dips. That was totally my bad, I read your article too Hope, and I should have remembered that! Yeah, I'm a little concerned because I used DIsney logos and whatnot, but if there are any issues, I doubt they would reject my pass. I'm sure they would ask me to stop. At that point I'd just take it home and sort of un-Disney-fy it and make it a little more generic. I'm going to be at the park for the next two days, Sunday evening and all day Monday, in and out around LIttle Green Men. If anyone wants one, come get one! I'll finish another draft when I get back, and post it here for a last check/edit. Once everyone is happy, I'll print more and leave it posted somewhere as a PDF people can download. And I have to say thanks for the encouragement, it makes it worth it! The images and pamphlet layout and design look professional, which is a big plus because that adds to the seriousness of the message. The "for their sake" emotional hook is an effective attention grabber. Thank you for the time, thought, and effort that you spent on creating these pamphlets. A great pamplet! I have just one comment - you talk about the various patterns on the backs of pins, and that the patterns should always run smoothly off the edge on legitimate pins. However, the patterns on WDI and DSF (the "ice cream cone" pattern) pins do not necessarily run off the edge, and this has been discussed on these boards. They are full size jpgs and should print out on a regular sheet of 8.5x11 just fine. Either do it double sided or flip the page over and fold. Thanks again for all the great feedback, and have a happy New Year!!! My next draft, I'll go ahead and make changes to reflect WDI, DSF, and DA pins (I noticed the same thing on those too). However, I did notice that while they might not run off the edge, I have not seen any with those nasty borders we all despise either. But for now, considering I and these out to relatively new traders in the park, they probably won't have their hands on any WDI, DSF, or DA pins any time in the future, but hopefully by the time they do, they will know the difference ^_^! Ah yes, and should I include anything about magnet tests or blacklight? I don't know how tried and true those methods are yet, but if it seems to work out or someone can think of a good way to word it, I would be more than happy to include them. Since neither of these tests are definitive, I would leave them out for now. Thanks again for doing this Geoff! This will be a great resource to help spread the word. 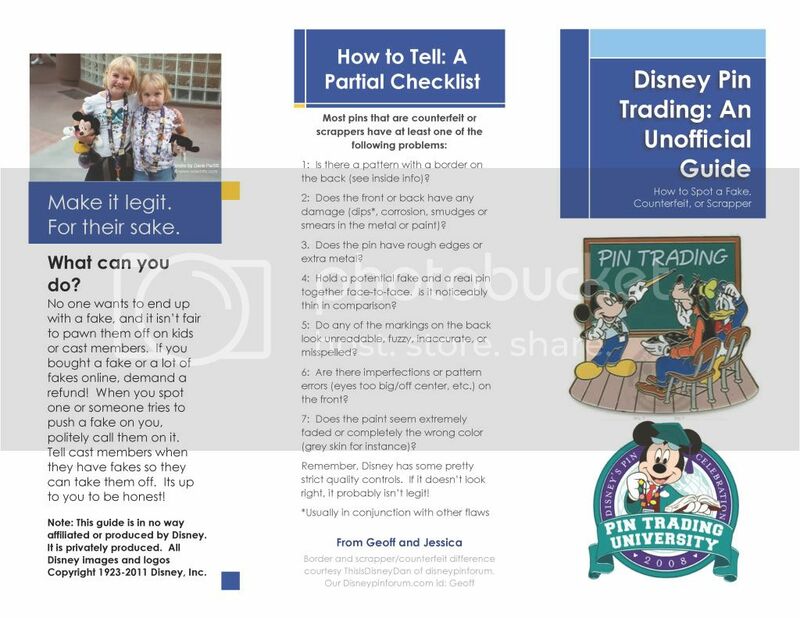 Even if we only educate a small number of new traders (relative to the overall number of people who buy & trade pins), that's still something. Please, please please, take this as positive criticism. That is what this post is intended to be, to help you make this better. I am new here and you don't know me, nor I you, so it was hard for me to do this. Just keep in mind as you read down this post, I am heading to WDW in December and would love to have a hundred of these printed off to stick in my pin bag. I am trying to help improve, not tear down. First and foremost, I think the use of ANY Disney logo or character on something like this that you plan for people to have, use, or distribute at any Disney park is very, very risky. Disney does not take well to unofficial use of any character or logo. They are extremely active in protecting their assets and trademarks and wouldn't think twice about slapping this down in a millisecond, well intentioned as it is. I don't think the micetype at the bottom about the (c) is gonna work. Here, on the net, maybe, but if a CM gets one of these at WDW or DLR, then there is going to be a big furor over it. Next, the photos concern me a bit. I don't know if those are your family or not. Do you have photo releases for the kids if they are not yours? How about photo releases for the people in the shot on page 2? If those people in the photos are not your family, then I would be very careful about mass publishing them. Publishing photos of kids who are not yours, is a very big gamble today. Twenty years ago, nobody would give a darn. Today, woof, lawsuit waiting to happen. #3, has a period instead of a colon. "The pattern runs smoothly off the edges, as from the back, real pins look like they were cut out with a cookie cutter out of a single sheet of metal, as this is how they are really made. Counterfeits are molded instead of cut from a sheet and the back pattern has an irregularity due to this process. There is a telltale border around the edge of the back." Real pins should have the pattern, called a "waffle", run cleanly off the edges on the back. Real pins are cut from a single sheet of metal, cookie cutter style. Many counterfeit pins are molded, one at a time, instead of cut from a sheet. Molded counterfeit pins may have a telltale border around the edge. This border causes the pattern not to run off the edges like they do on real pins. "To better understand this problem so that you may protect yourself, there are a few things you should know." Maybe should be: "To better understand this problem, so that you may protect yourself, there are a few things you should know." The "so that you may protect yourself" is a secondary thought to the sentence and needs commas. "There are two main types of fake or unofficial pins, scrappers and counterfeits." should be "There are two main types of unofficial pins, scrappers and counterfeits." The double-double thought might be hard to follow for some. If you insist on having "fake" in there go with "There are two main types of fake/unofficial pins, scrappers and counterfeits." Bolding might help. As for the definition of scrapper, you may want to see my post here. The term "scrapper" has come to mean more than just the original way the term was coined. Not sure how you want to re-word the definition or if you want to re-word it at all. I just thought you might like to see what another definition might be. Once fixed (read: finalized), are you going to be able to have a higher resolution image set available? The low resolution ones may not print the best. I have a high resolution color laser printer and I am not sure how well it will do with the low res jpegs. May I also suggest posting them in PNG format as it is a lossless format that won't introduce jpeg noise into the image. PNGs will keep the images clean and the text crisp. Again, thank you for your effort. 1. Yeah, the use of anything Disney is risky. I know that the copyright disclaimer isn't REALLY doing anything, it was sort of just making me... feel better... but< i don't really know what I would use in place, and in marketing image is everything; if it isn't instantly brand recognizable, its trash. Basically, give me some ideas and I'll see what I can do. 2. I hadn't even thought about the pictures of kids and the other people... Don't really know what to say. The pictures of the older people should be OK; as long as an individual is over the age of 18 and in a public place, the image can be used. The little ones however... Oi... Yeah, something has to be done about them. I used them because there is a deep psychological ploy when using kids. Basically, guilt is WONDERFUL, and telling people to be honest "for the children" is a dead ringer. Again, ideas would be great on how to get this across legitimately but effectively. 5. (Center Column page 2) Thank you, your version does indeed sound less cluttered and confusing. 6. (fake/unofficial) I like this edit as well. Duly noted and accepted. 7. Scrapper definition - I feel like you took the idea of a scrapper and came up with every single last possibility possible, some that I had never considered and that truly scare the hell out of me. There is no real way to include them all in such a short space, and this is intended for pin newbies, but I will try to fit a "for more information" section in the 2.0 version. 8. Resolution - I used the pamphlet design suite found within Office 2011. If you can tell me how to save them as larger than an 8.5"x11" I would be more than happy to, or I could send you the original word file and you can have a go. I know how to design within Adobe CS5, but it takes me 20 times longer if I take that route. Oh, and as far as image resolution, the images that I started with didn't have the great of resolution themselves; they we are under 600x800. So, if a creative solution is found that replaces them, it will improve. Thank you again for your input; like I said, it is exactly what I was looking for! I'm going to go and work on a 2.0 right now and post it when it is done, some time in the next few days, and you can take a look and let me know what you think. I most likely will post the original on a file share site or something when they are done and we can see what could be done about size.